Aoibhin Garrihy shares sweet snap of daughters christening | SHEmazing! Actress Aoibhin Garrihy certainly has a lot to smile about. Yesterday, the 31-year-old celebrated the christening of her gorgeous baby daughter, Hanorah. 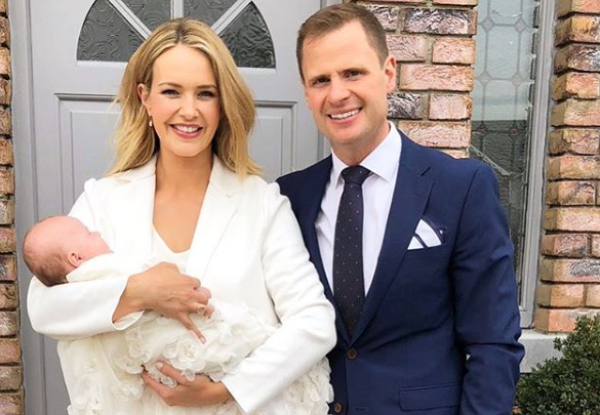 The special event took place in County Clare and Aoibhin posted a snap to her Instagram of herself cradling the baby alongside her husband John Burke. The pair decided to keep things local by having the ceremony in the church of Ss. Peter and Paul in Ennis town. In a cute twist, Aoibhin reused her wedding dress from when she tied the knot back in September 2016, for the Christening gown. The couple also chose Aoibhin's sister Ailbhe as godmother and John's nephew Callum stood for his cousin as godfather. She continued, "Ailbhe just loves babies. When we were small, I loved Barbie and dressing them up in high heels and different outfits, Doireann loved animals and Sylvanian Families and Ailbhe was just obsessed with babies from the word go." Her followers were quick to post their well wishes and sweet comments. Huge congratulations to Aoibhin and John on their special day and beautiful baby girl!